Nothing prepares you for the sight of your first decapitated kangaroo, but after 1500km of driving on Queensland roads in the last couple of weeks, Jane and I are getting quite used to the sight. We’re hoping to knock the block off one ourselves – everyone else is doing it. Yes, we’re back in a camper-van. Not one painted with drug-induced abandon I might add, but a striking orange and white “Spaceship”. It doesn’t fly, reach anywhere near warp-speed or even have a place to sit in the back, but it is like driving an Aston Martin compared to our NZ van and it already has a name painted on the side – “De Lorean” – so apologies for those of you hoping to win a stroke of the beard via another naming competition. 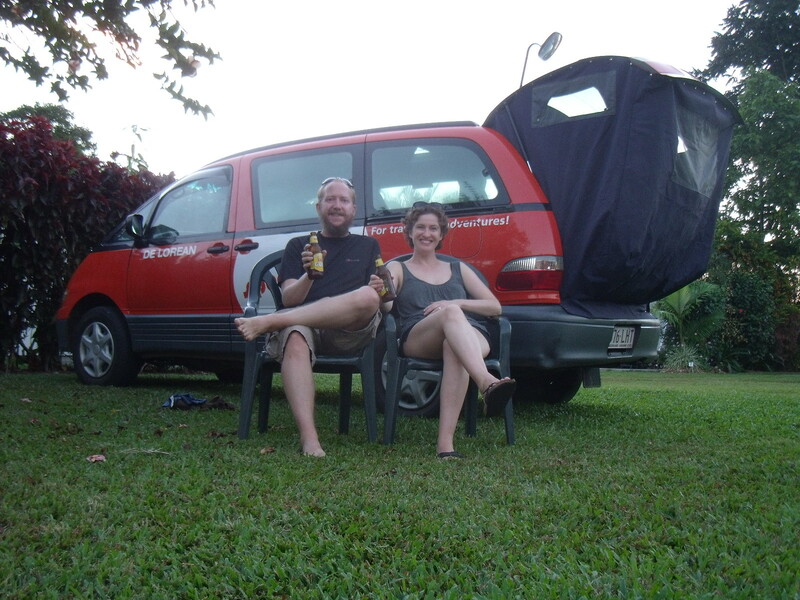 We picked it up in Cairns after a night in Melbourne in a pretty scummy hostel – a far cry from the palatial surroundings we’d left in Clifton Springs at Jane’s friends’ house. It’s the first time I’ve seen someone taking cocaine in a hostel toilet, but perhaps that’s the only way he could cope with it. Melbourne itself is our favourite Australian city so far, though we only had half a day to explore. It was busy and easy to navigate and a lunch of Chinese roast pork will always help you like a place. Our flight to Cairns arrived late, so shamefully we didn’t have it in us to walk out on the incredibly racist 107-year-old hostel receptionist and instead simply stood wide-eyed with disbelief as she tore strips off a perfectly polite and intelligent Indian guy. As Edmund Burke rightly said, “evil prevails when good men do nothing”. Just to clear up any confusion, we’re good and she was proper evil. 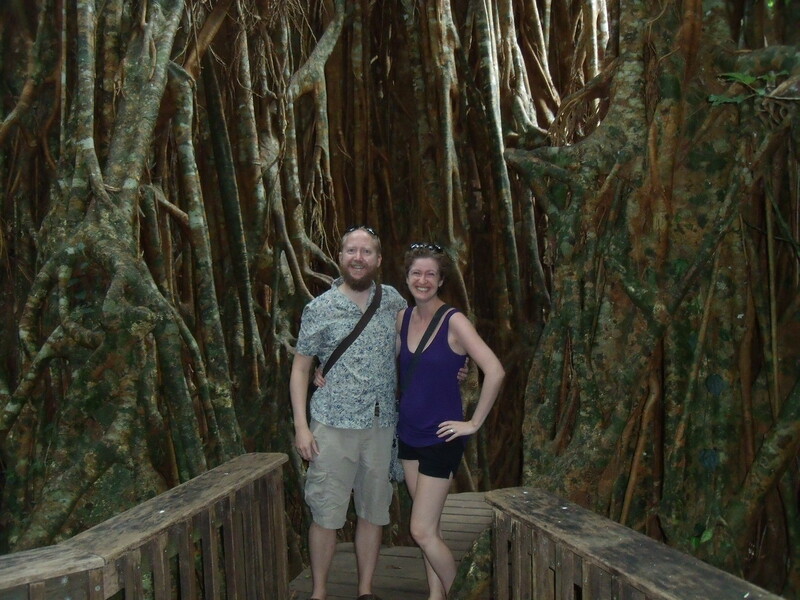 After a walk through hot and sunny Cairns the following morning, we picked up “De Lorean” and briefly got on the road. Unfortunately, after we stopped to pick up lunch soon after, the bloody thing wouldn’t start! Two hours and a new battery later and we were finally on the Bruce (Highway), heading south. Jane’s friends and family will surely sympathise with me when they hear that she has taken on the role of DJ in the van. She also picked up more “girl” music when we stayed in Clifton Springs, so my ears are permanently bleeding. After testing the van on the 300+ corner Gillie Range road, our first stop, believe it or not, was to look at a couple of fig trees. No, really. And they were good – very eerie looking, mighty things like something out of Lord of the Rings. Jane loved them of course. 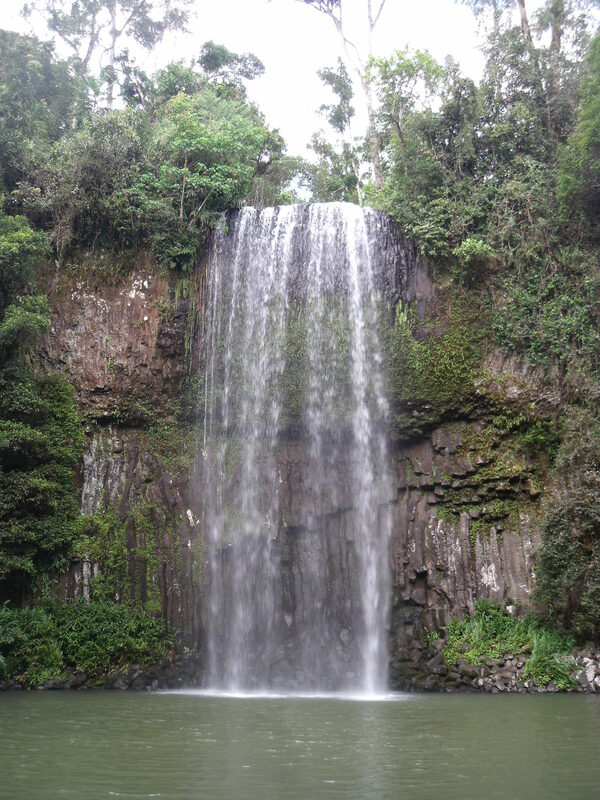 You’ve probably learnt by now that we do like a waterfall, so it’ll be no surprise to hear that we did the nearby “Waterfall Circuit” that afternoon – each of the three had its merits and a very pleasant day it was to be picnicking in the shadow of Millaa Millaa falls. It was only slightly ruined by the large group of “Oz Experience” twinkies who were whooping it up in the pool while we tried to picnic. Ho hum, we are old. We’d earmarked the following day for sunbathing on Mission Beach down the coast, but inevitably we woke to pretty heavy cloud, the first in days. 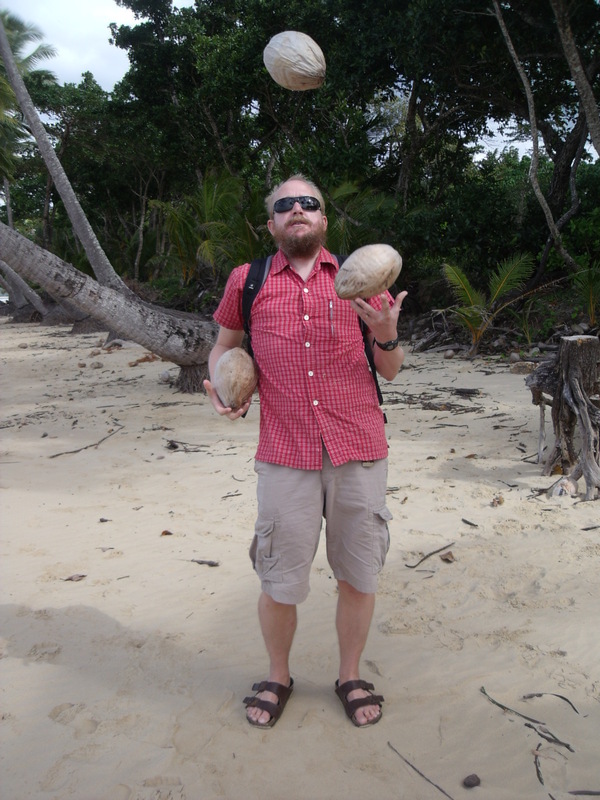 We decided to carry on in the hope of the weather clearing, but sadly it stayed overcast so we had a stroll down the beach, juggled some coconuts and remained stubbornly white. We pushed on the next day to Townsville (a bit like Croydon but with less skinheads and more sunshine), stopping en route at the most beautiful (and considering it was a bank holiday, quiet) Paradise watering hole, for a picnic on the rocks and a very chilly dip after confirming the absence of crocs with some swimming locals. Jane would like it to be known that her Spanish omelette that evening actually drew a round of applause from on looking backpackers. I would like it to be known that it could have done with an extra 30 seconds or so, and the silverbeet added little. 8/10. We’ll skirt round the 4.15am alarm for England’s disappointing start in the World Cup that night (there really is no worse place to be watching it I guess) and instead focus on the realism that has descended on the Aussie media following the Socceroos’ humiliation the following day. Never have I been so delighted with a German victory or seen such a climb-down from the media that 24 hours earlier was talking about Lucas Neill as if he were Bobby Moore. Now the squad is too inexperienced and the coach is a buffoon, and they knew this all along (yes, it’s just like being in England). It’s actually pretty tricky to see much of the football, due to the time difference and lack of TVs on the camp-grounds, but we’re ensuring that every time England play we’re in front of whichever grainy screen we can find. I’m also indebted to a friend who is providing fabulous daily text updates, so I almost feel as if I am there. Anyway: enough football. 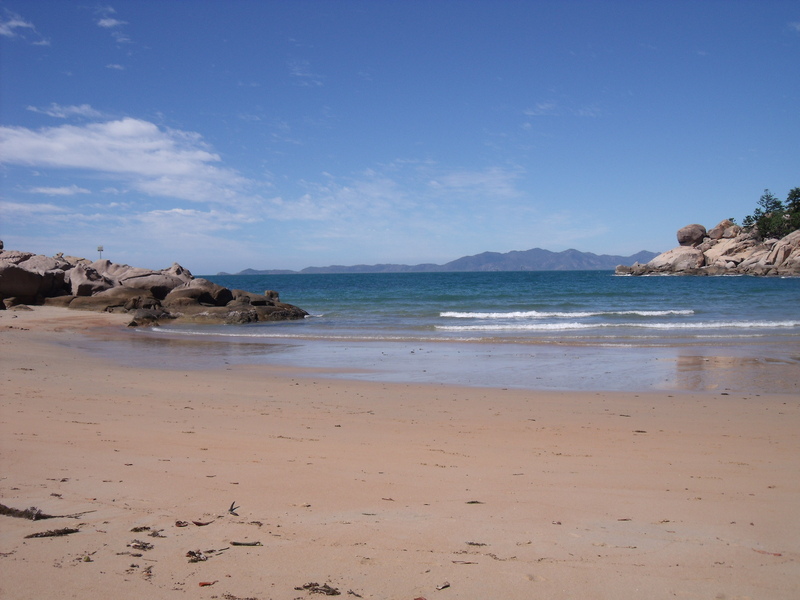 From Townsville we took a ferry over to Magnetic Island to do some snorkelling in the glorious sunshine. A road closure meant that we couldn’t get to the bay we wanted to, so had a lie on a different beach and then went up to the biggest bay, where the water was an unappealing muddy brown. 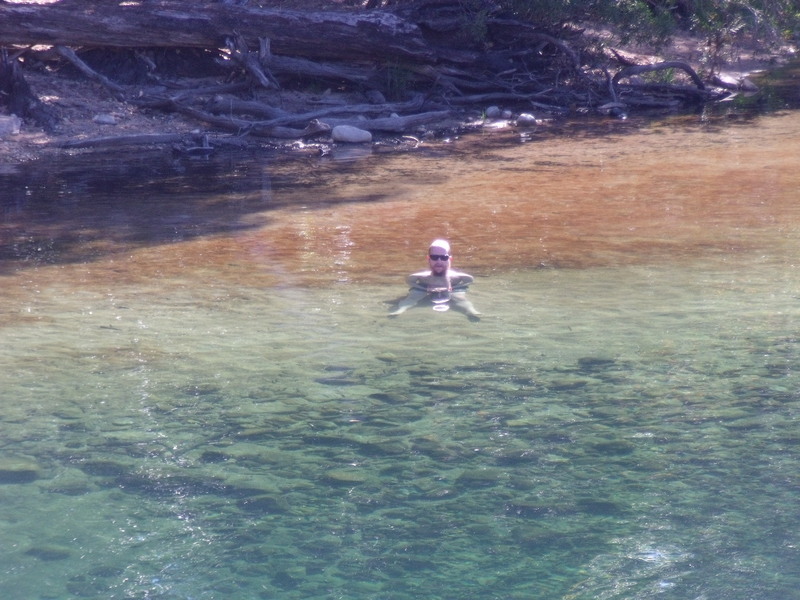 As a last resort for snorkelling, we headed to another bay. Alas, the tide was out, so all we could do was skim a few stones, debate what proportion of women dye their hair (the consensus says about 70%) and stroll in the background of a beach-side wedding video, resisting the temptation to drop our trousers and heckle. Stary lady: You didn’t happen to see anyone take a bag out of the kitchen did you? Me: No, I’m afraid not. She clearly didn’t believe me but for once, I was telling the truth! 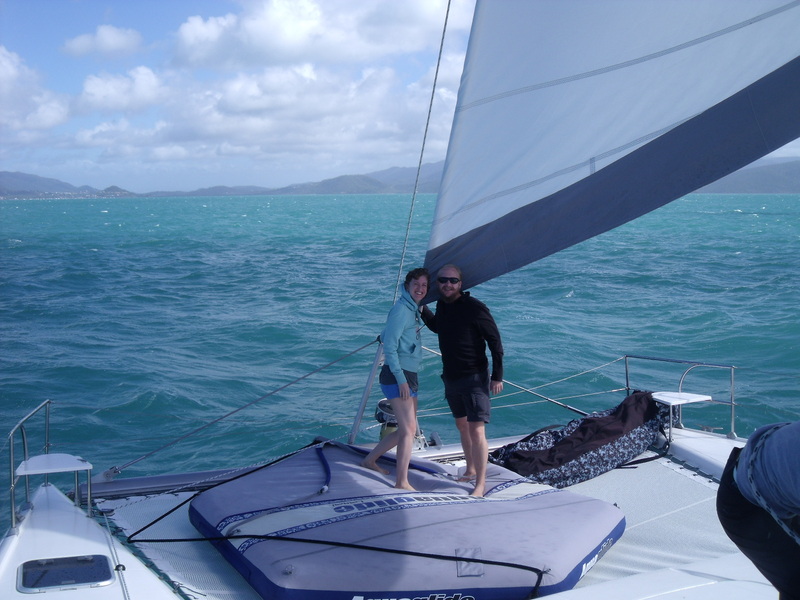 The following day we took a long drive to Airlie Beach to book a sailing trip in the Whitsundays. We were planning on going the following day, since we’d only arrived in town at 2pm, but they had some stand-by deals leaving that afternoon. So, we found ourselves at 4pm boarding for a two-night trip. 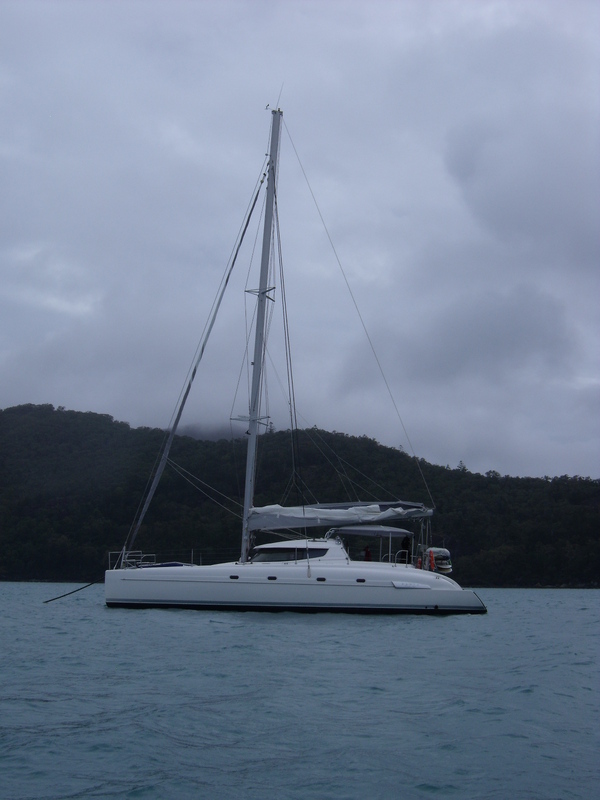 The boat was lovely, a new catamaran, with an Aussie-German couple running it and 5 other passengers (2 Danish girls, a Canadian guy and 2 American guys), all of whom were very nice. Shaves all his body hair. Has 2 cans of hairspray with him. Owns a hairless cat a la Dr. Evil. Screams like an 8-year-old when startled. Asked for skimmed milk for his cereal – and when they had none, he asked for soya milk. Is scared of spiders (and many other things). Has never touched alcohol, smoked or tried any drug. Has a tattoo on his toe (he claims it’s an ex-girlfriend’s name, but it looks like “Jack” if you squint). Has an iPod which contains mostly Andrea Bocelli and Celine Dion (the latter is entirely unacceptable regardless of sexual orientation). Is on holiday with his friend Scott (at whom no aspersions are being cast – Scott we salute you (although they do play-fight rather a lot for 30-year-olds)). Ladies and gentlemen of the jury, I rest my case. Thankfully, he took our collective gentle (but persistent) “outing” of him in exceptional spirits, especially when he said that the food was better than on most boats and I asked him if he knew that because spent a lot of time with sailors. Our only full day on board “On Ice” was somewhat spoiled by the heavy cloud and occasional rain we had. We had a good snorkel on a reef in the morning, in spite of my snorkel sinking immediately when I dove in, and my wedding ring slipping off during the swim (though thankfully it lodged on some coral 6 feet below me, so I was able to dive like that small child in the Cheltenham & Gloucester advert from some years ago to retrieve it). 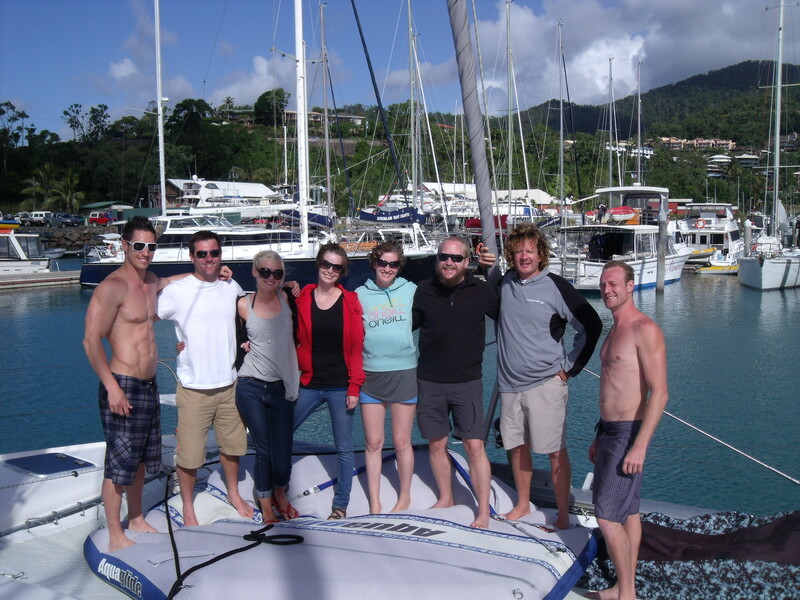 Thankfully, our choice of boats paid dividends after our snorkel as the weather was still rotten. 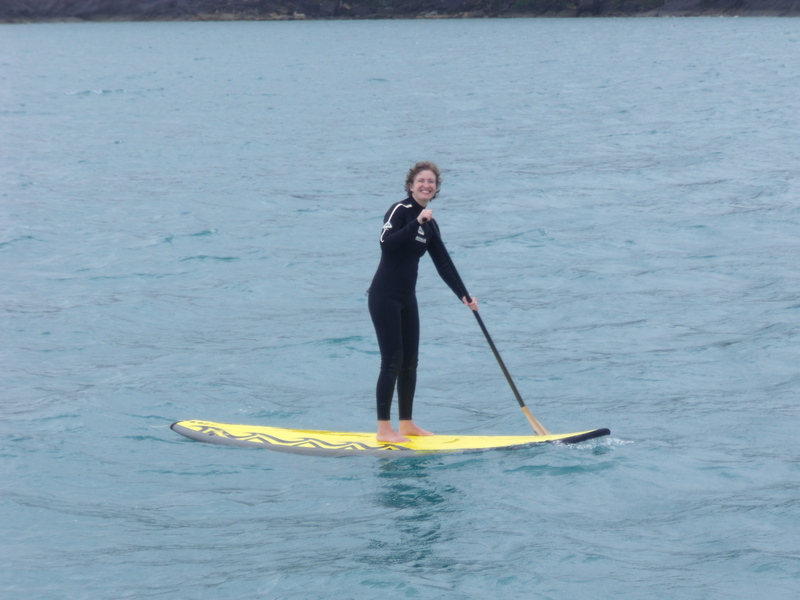 We took to the stash of toys they had onboard, trying our hands at paddle boarding (very successful) and windsurfing (less successful). 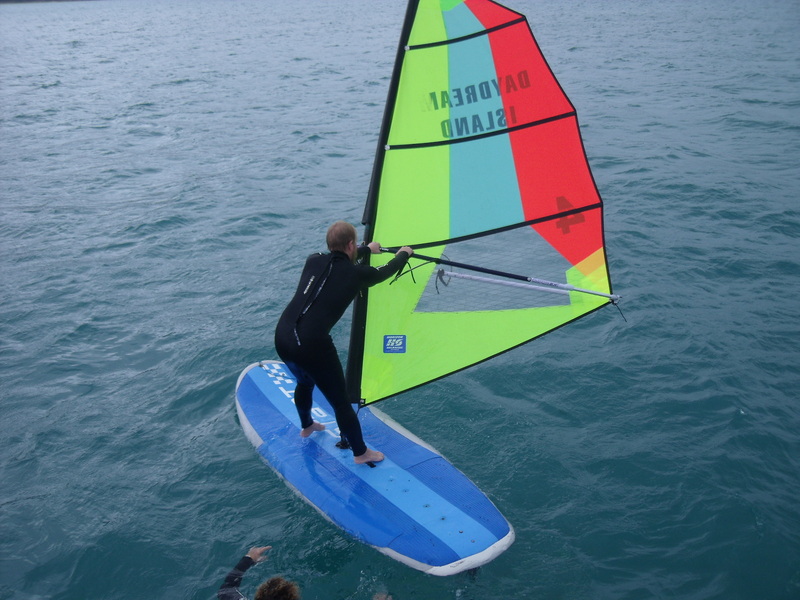 In my defence it was very windy for a beginner to be having his maiden voyage/sail/board/trip, but I was pretty hopeless. Going in one direction I got stood up a couple of times and covered quite some distance (mostly unintentionally while flopping around like a beached whale). However, when I tried to turn (in installments) for home, the board and sail trapped my leg, the board flipped and I was so exhausted I couldn’t right it! Waving forlornly for help was my only option and thankfully Captain Luke came to the rescue. Ben the Canadian fared far better and Jane’s short journey was partially successful. Don’t tell anyone, but they both had the smaller sail, akin to having stabilisers on your bike, while my racing sail could have covered 3 football fields and carried you airborne halfway around the world. Conditions on board were far better than our Galapagos vessel and we slept well, ate well and thoroughly enjoyed the company. In fact, the only downside I can remember was realising that Jane’s extremely expensive laser eye surgery was a total waste of money when she mistook a wetsuit hanging on a boat behind us for a human being. On our second and final day, the skies had cleared and the sun was at least partially out. We took to the waters again for more snorkelling, this time with a James Bond Thunderball-style underwater propulsion unit, which was extremely cool and great fun – at one point pulling four of us along. I want one for the bath when we get back to the UK. The crossing from the islands back to Airlie Beach was pretty choppy and I’ve only just stopped feeling like I’m on a boat, two days later! There’s nothing much to report for the last couple of days – lots of driving, lots of wide loads (at one point I swear I saw a small stadium being transported) and some infuriatingly backwards technology – how can a country as developed as Australia not have a TV in any of a town’s 4 campsites (I’m just bitter because I’ve had to pay the equivalent of a return flight to South Africa and a ticket in the royal box for a cabin with a 14″ TV here, but bear in mind that every camping ground in NZ had a TV room) and barely an internet connection in 1000km. We’re running out of time in Australia fast (we fly to Tokyo on the 24th), so are currently debating the merits of surfing lessons, a Great Barrier reef cruise, Australia zoo (we’ve had our heads turned by talk of a zoo in Thailand where a man with many scars puts his head in a crocodile’s mouth), an extensive haircut for me and Fraser Island. Any advice is very welcome! That’s all for now. Fingers crossed our 4.15am start tomorrow morning isn’t in vain! « Welcome to the Perth Alzheimer’s Anonymous meeting. Welcome to the Perth Alzheimer’s Anonymous meeting. Welcome to the Perth Alzheimer’s Anonymous meeting. Welcome to the Perth Alzheimer’s Anonymous meeting. Welcome to the Perth Alzheimer’s Anonymous meeting. Welcome to the Perth Alzheimer’s Anonymous meeting. 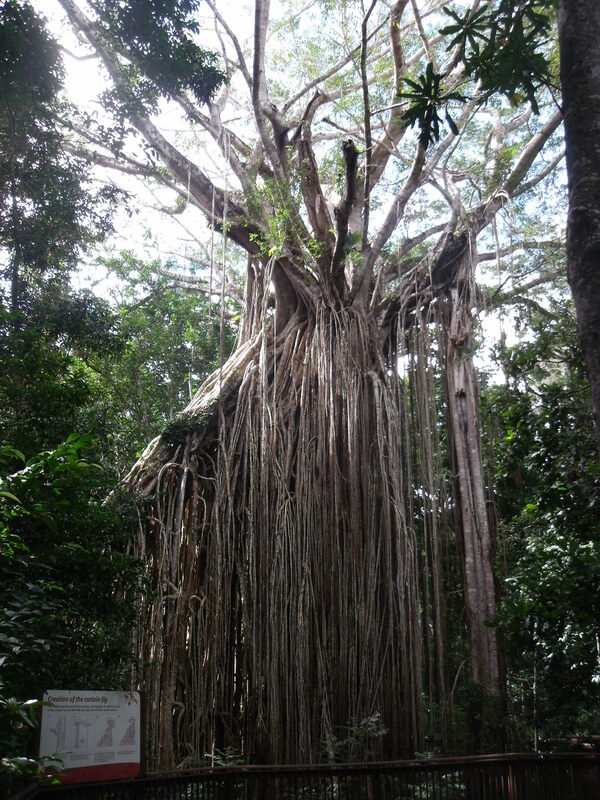 A friend went to Fraser Island and it did look fabulous – but I think the Reef is really special…. Good to know you are getting up to watch the football, it’s about to kick off so I’m going to watch with friends. Hi Gaynor. We were going to go today, but it was raining! Since we’re running out of days we decided to eat up some miles while the weather was poor, so it looks like we’ll do Fraser tomorrow. Fingers crossed for excellent reefs & diving in S.E. Asia. Got up, watched it, got down. And I had to put up with Ally McCoist as co-commentator. Good to read yet another entertaining blog! What a boring vehicle this time. Not surprised you don’t feel like naming it! It looks as if you’re having some fantastic experiences & it’s lovely to be sharing them with you.